Especially for applications with fire protection function the quality and reliability of the used products is of decisive significance. The decades of first-hand experience and the permanent and consistent further development of the proven DICTATOR operator series assure the long-term functional reliability of the door installations equipped with our products. Depending on the requirements there are available different operators for fire protection sliding doors, either for three-phase current or for direct current. 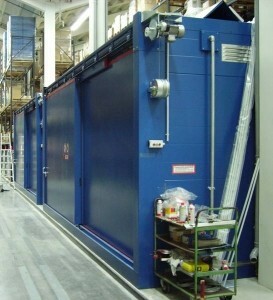 These allow to automate installations of small sliding doors up to large and heavy fire protection doors. Our technical department will gladly assist you in choosing the appropriate operator for your fire protection door and, on demand, will also elaborate a complete plan for the door system.